Kyabjé Drubwang Pema Norbu Rinpoche (1932-2009) was the 11th throne holder of the Palyul Lineage of the Nyingma school of Tibetan Buddhism. He was the supreme head of the Nyingmapa lineage from 1993 to 2001.After fleeing Tibet, he established Namdroling Monastery which is located in Karnataka State, in Southern India. Namdroling has become the largest Nyingma monastery in the world, where many khenpos, monks and nuns are receiving an education.Beside becoming learned in several subjects including writing, poetry, astrology and medicine, he studied the sutras with different khenpos. Lineage:Aged twelve, he received from Choktrul Rinpoche the most important transmissions and empowerments of the Nyingma School, including the great empowerment of the Kagyé and the Rinchen Terdzö empowerments. From Karma Kuchen Rinpoche he received the terma revelations of Ratna Lingpa. At twenty one he was fully ordained by his master at Tarthang Monastery following the vinaya lineage transmitted to Tibet by Shantarakshita, receiving all the essential instructions and empowerments of the Nyingma tradition. He also received at that time the cycle of Tendrel Nyesel, Lerab Lingpa's great terma revelation. He then completed a Vajrakilaya retreat and, having received all the transmissions of the Kangyur and Tengyur, he entered into retreat for four years during which his master gave him all the transmissions of the Palyul tradition, following the secret oral instructions of Tertön Mingyur Dorjé's Namchö. Penor Rinpoche successfully completed all the stages of the practice, accomplishing the root recitations of the Three Roots (lama, yidam, and khandro), the Namchö preliminary practices, tummo and tsa-lung, and Dzogchen practices. Biography: The Third Drubwang Pema Norbu ("Penor") Rinpoche was born in the Powo region of Kham, East Tibet to Sonam Gyurme (father) and Dzom Kyi (mother) during the twelfth month of the lunar calendar the year of the Water Monkey (1932). His birth took place during the most bitter, cold, bleak and dry part of the winter season, a time when nothing grows and the land is blanketed with thick, deep, heavy snow. Yet at the time of his birth, sweetly-scented flowers burst into blossoms all around the home of the infant tulku. Moreover, two search parties for the new tulku, one sent by Dzogchen Rinpoche and one sent by Khenchen Ngagi Wangpo, met each other at the same time at this same house, thus confirming the recognition without doubt. Communications and travel in the high mountains of Eastern Tibet were not as speedy as today so this was considered to be a very auspicious sign. Khenchen Ngagi Wangpo Rinpoche foresaw the exceptional destiny of the new incarnation. In 1936, the year of the Fire Mouse, the young Pema Norbu ("Penor") Rinpoche was invited to the Palyul monastery where he took refuge with the great and learned Khenpo. Khenchen Ngagi Wangpo Rinpoche performed the traditional hair-cutting ceremony and gave him the name "Dhongag Shedrup Tenzin." Khen Rinpoche then granted him the long life empowerment of Amitayus and composed the long-life prayer which was chanted daily by thousands of Penor Rinpoche's followers all over the world through until the time of his parinirvana. Rinpoche was formally enthroned by his master Thubten Chökyi Dawa (1894-1959) [the second Chögtrul Rinpoche], and Karma Thekchok Nyingpo (1908-1958) [the fourth Karma Kuchen Rinpoche]. In time, Penor Rinpoche would become the Eleventh Throneholder of Palyul Monastery with its more than four hundred branch monasteries. He spent many years at Palyul, studying and receiving teachings from numerous masters and scholars. 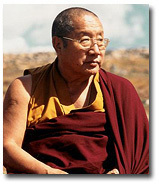 He received mind-to-mind transmission from Lungtrul Rinpoche Shedrup Tenpai Nyima. He also received training and instructions from the Fourth Karma Kuchen Rinpoche, the Tenth Throneholder, who carefully prepared him as his successor. In turn, His Holiness Penor Rinpoche trained the Fifth Karma Kuchen Rinpoche. There are many instances demonstrating Penor Rinpoche's extraordinary powers even as a young child. On one occasion he was playing with an old and precious vajra when it suddenly slipped through his fingers and dropped to the ground, breaking in two. Fearing a reprimand from his teacher, he quickly glued it back together with his own saliva, making the vajra stronger than ever before. A similar incident occurred later on when, during the Chasum ceremony, he accidentally dropped his ritual bell onto the stone floor. Everyone assumed that the bell had shattered, but when Penor Rinpoche picked it up, it was unbroken and rang even more sweetly than before. At the age of 15, Penor Rinpoche left his footprint in stone near Dago retreat monastery above Palyul where it can still be seen today. Once while he was still young, Rinpoche was approached by an old man who insisted that he practice Phowa for him. Innocently he complied with the request. At the end of the practice, he shocked to see that the old man had passed away - the Phowa had worked only too well! Immediately he started to practice again, to revive the corpse lying there in front of him. To his immense relief, the old man came back to life, but instead of thanking him, he shouted, "For heaven's sake, why did you bring me back? I was already in the Pure Land of the Buddha Amitabha!" Penor Rinpoche made his first visit to the United States in 1985. In 1993, he was elected the Supreme Head of the Nyingmapa, succeeding Kyabjé Dilgo Khyentse Rinpoche. In 2001 the title passed to Kyabjé Minling Trichen Rinpoche. There are several centers of Playul Ling located throughout the world. The main seat of Penor Rinpoche is at Namdroling Monastery in South India.